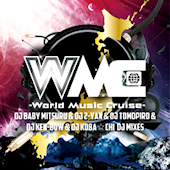 New entry in FARM’s World Music Cruise series, which are digital only non-stop mixes by some of Japan’s top EDM artists. This one is mixed by 5 different DJs for some reason, one of whom is DJ Ken-Bow of Delaction. 24. [3:48] Again and Again (Extended Mix) / Basto!